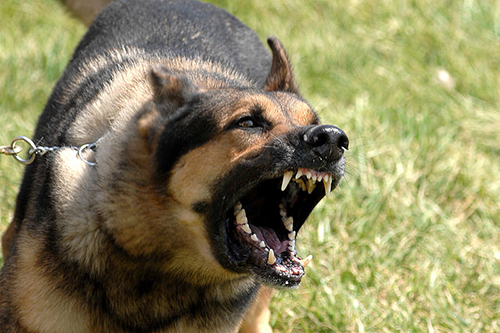 Some dogs snarl and snap at anyone—familiar people, even their owners. Other dogs display aggression more selectively, directing it toward strangers, people, or dogs that happen to be unfamiliar. Curiously, the snarlier dogs and the relatively subdued dogs tend to be genetically distinct. Approximately one dozen genes have variants that are associated with sociability, or with fear and aggression. The gene variants were uncovered by researchers based at Nationwide Children’s Hospital. According to these researchers, reduced-fear gene variants may have been involved in the domestication process. The researchers also assert that their findings are relevant not only to dog behavioral problems, but also to human anxiety disorders. The new findings appeared August 8 in the journal BMC Genetics, in an article entitled, “Genetic Mapping of Canine Fear and Aggression.” In the near term, the findings could inform genetic tests that would reveal the risk of specific types of fear and aggression in dogs. In the long term, the findings could shed light on human anxiety disorders and aggression, violence, and criminality. The researchers found that known loci variants (IGF1 and HMGA2) for small body size are associated with separation anxiety, touch sensitivity, owner-directed aggression, and dog rivalry. The researchers also notice that two other loci (between GNAT3 and CD36 on chromosome 18, and near IGSF1 on the X chromosome) are associated with several traits, including touch sensitivity, nonsocial fear, and fear and aggression that are directed toward unfamiliar dogs and humans. Because these risk variants are common across dog breeds, the canine veterinary setting provides an ideal test bed for new therapies targeting those biochemical pathways. Once it is determined which neuronal circuits are affected by the risk variation, this will likely reveal drug targets that could be inhibited or activated to increase or decrease the emotional behavioral effects. Those findings can immediately be tested in pet dog patients under owner consent. And, if those therapies are effective in dogs, they can then be applied to humans with similar conditions. Knowledge of the affected pathways will also provide biomarkers that can be used to identify the patients who are most likely to respond to such treatments. Previous articleCan a Dirty Mouth Worsen Colorectal Cancer?